The Itsy Bitsy Spider Crochet: The Tree! I'm so excited that I finally had time to finish my little adventure in soft sculpture. This tree is finally done! In fact, I was so excited about finishing this project that I couldn't even wait for the best light to photograph it. I set up some spotlights around the ol' light box instead -- probably did a lousy job of it based on the size of the shadows in the background! Of course, with finishing the tree, I just had to play around a little with it. The little hidey-holes are the perfect size for fuzzy whazzits and for the owlettes. Now that I'm done with this tree, I'm going to start making a second. I wrote down the pattern notes as I made the tree, but I want to be absolutely sure that they're right. 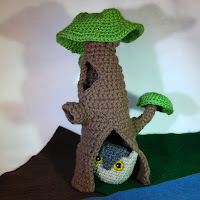 The tree is a funky project with a lot of twists and turns but it's all single crochet, so I think even a beginner might be able to tackle it. I'll keep you all posted on the progress, and I plan to list the finished trees on Etsy as soon as the pattern is completed. While I'm working through the second tree, I would love to hear your thoughts on the design. Anything I could/should have done differently? What would you want if it was your tree? As always, I love getting your feedback and look forward to hearing from you! that is so friggin cute!! I love this! I've said it before but I'll say it again....you are SO creative! It's such a perfect home for the fuzzy whazzits, and they look so cute sticking out of the holes! Great job on this!